Obsidian: Mineral information, data and localities. black, bluish, mahogany, golden, peacock, etc. - the colors due largely to refraction by microscopic bubbles (and microscopic mineral inclusions such as magnetit in "Rainbow Obsidian"). Glassy, fresh igneous rocks with a high silica content and conchoidal fracture. 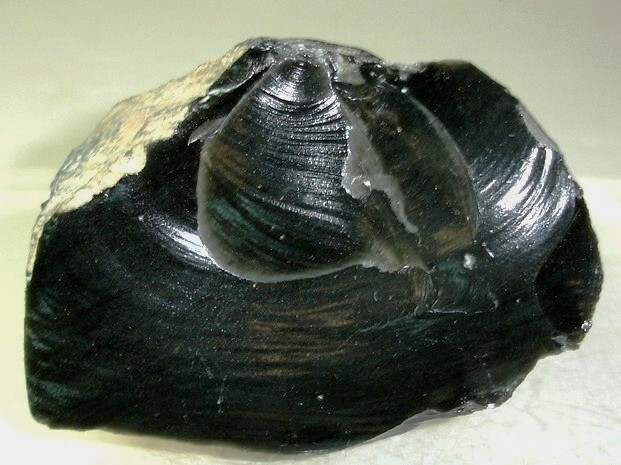 The earliest manufactured mirrors were pieces of polished obsidian. Volcanic glass - a rock rather than a mineral, it is a mixture of cryptocrystalline grains of silica minerals in a glass-like suspension, a super-cooled liquid. Obsidian is formed in the latest stage of volcanic eruptions, the silica left over after most of the other elements and water have been used up are ejected or flow out and rapidly chilled at surface temperatures. A lot of gem-quality water-clear variously coloured 'obsidian' has been offered for sale on the internet (in particular on auction websites) with a variety of sources listed. The material offered for sale is, in fact, an artificial glass mass-produced in places such as Indonesia. 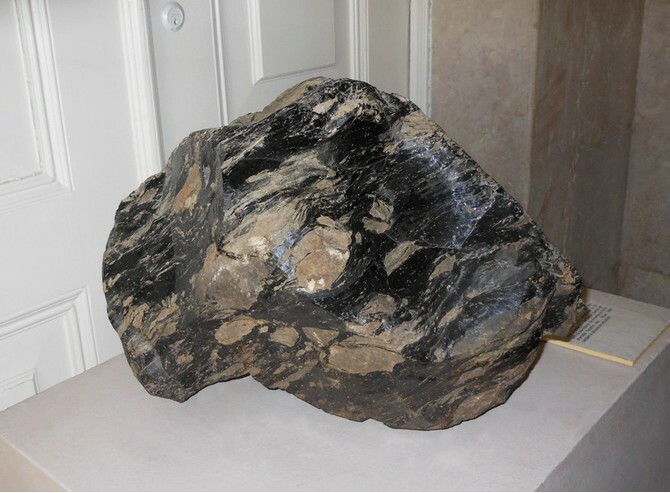 Visit gemdat.org for gemological information about Obsidian. Rainbow Obsidian Obsidian with multicolored iridescence caused by inclusions of magnetite nanoparticles (Nadin, 2007). Sheen Obsidian A variety of obsidian exhibiting a golden sheen effect. 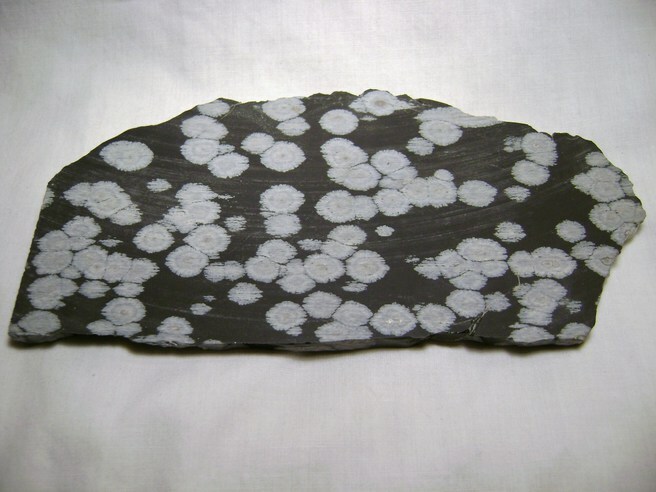 Snowflake Obsidian A rock - a natural volcanic glass containing white 'snowflake' crystal patterns of the mineral cristobalite, originated due to partial crystallisation of the glass. Cristobalite 49 photos of Obsidian associated with Cristobalite on mindat.org. Apache Tears 27 photos of Obsidian associated with Apache Tears on mindat.org. Fayalite 14 photos of Obsidian associated with Fayalite on mindat.org. Pyroxene Group 5 photos of Obsidian associated with Pyroxene Group on mindat.org. Quartz 2 photos of Obsidian associated with Quartz on mindat.org. Opal-C 2 photos of Obsidian associated with Opal-C on mindat.org. Spessartine 1 photo of Obsidian associated with Spessartine on mindat.org. Rose Quartz 1 photo of Obsidian associated with Rose Quartz on mindat.org. Jasper 1 photo of Obsidian associated with Jasper on mindat.org. Tiger's Eye 1 photo of Obsidian associated with Tiger's Eye on mindat.org. Stevenson, R.J., Dingwell, D.B., Webb, S.L., and Bagdassarov, N.S. (1995) The equivalence of enthalpy and shear stress relaxation in rhyolitic obsidians and quantification of the liquid-glass transition in volcanic processes. Journal Volcan. Geotherm. Res. : 68: 297-306. Gimeno, D. (2003) Devitrification of natural rhyolitic obsidian glasses: petrographic and microstructural study (SEM+EDS) of recent (Lipari island) and ancient (Sarrabus, SE Sardinia) samples. Journal of Non-Crystalline Solids, 323, 84-90. Zotov, N. (2003) Structure of natural volcanic glasses: diffraction versus spectroscopic perspective. Journal of Non-Crystalline Solids 323, 1-6.